Last week, the Opportunity Green conference took place at the LA Center Studios in downtown Los Angeles. It brought together CEOs, industry representatives and government interests to talk about the green and sustainable energy partnerships and initiatives. The two-day conference also featured three LACCD colleges and the training they provide in these areas. 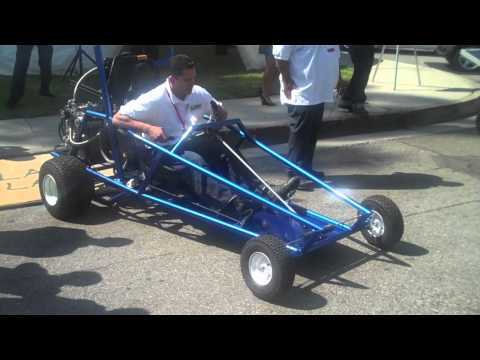 Of course, Los Angeles Trade-Technical College was right up front with its three alternative fuel go-karts developed through the STEM program. Led by biofuels instructor Jess Guerra and welding instructor Che Chancy, Trade Tech students not only explained the “clean” cars to the conference attendees but they rode the vehicles through the middle of the conference staging area. The conference attendees were amazed at the speed and design of the vehicles running on solar power, biofuel and liquified petroleum. The karts also drew the attention of several media including KMEX reporter Antonio Valverde who interviewed our students and delivered a great piece on Friday’s news. Once again, the innovative training at Trade Tech is front and center, thanks some great instructors, students and the leadership of the Workforce and Economic Development department. On Thursday, Avatar actress Michelle Rodriguez, solar-powered vehicles, basketball star Shaquille O’Neal and eco-friendly bento boxes collided in downtown Los Angeles. All were elements of the fourth annual Opportunity Greenconference at Los Angeles Center Studios, where television shows such as “Mad Men” and “Project Runway” have filmed scenes. Roughly 650 participants are registered for the event, which continues Friday. The idea, organizers said, is to show green companies that profit doesn’t have to be a pipe dream. While accepting her Eco-Maverick award, Rodriguez told attendees to “embrace the new era of capitalism.” Then, she showed off her deejaying skills at the after-party. Panels followed the same model, focusing on topics such as the smart grid industry and “The Business Case for Sustainability.” In a session about “What’s Hot in the Greentech Market,” speakers touched on the controversial Proposition 23, the balance between customer and product development, competition from countries such as China and Germany and the desire for a long-term energy standard from the government. The green economy is a “fundamental technology shift” much like the innovation sparked by the space race and the dot-com boom, said Micah Kotch, director of operations at business incubator NYC ACRE (New York City Accelerator for a Clean Renewable Economy). “At the end of the day, we have a small window to manage the unavoidable and avoid the unmanageable,” he said. Elsewhere, near a large dragon-shaped installation of plastic bottles, exhibitors displayed lounge chairs made of recyclable nylon and steel, eco-friendly paper products and sleek bento boxes made of “safe” plastic free of dangerous chemicals. Flowers bloomed from the plant pots and wall-mounted “garden pouches” of Portland-based Root Pouch, which uses recycled water bottles and other reused materials to construct its products. GreenHouse – the San Diego microfueler company that converts organic waste into ethanol – was there with a large poster of O’Neal, its initial investor. The Art Center College of Design, based in Pasadena, set up a tent to showcase several student projects, including a cycling helmet, hair dryer and iron all made from recyclable materials. Nearby, representatives from Los Angeles Trade Technical College zipped around in small alternative-fuel-powered carts designed by students. The propane cart can exceed 60 miles per hour while the solar machine putters around at about 20 miles per hour. The biodiesel vehicle runs on old cooking oil from the college’s culinary school.